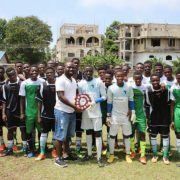 We are delighted to announce the launch of the Robert Kofi Mintah aka Striker Award. The history behind this was as a result of the recent passing of a great man who served at the Academy for many years. Robert was very instrumental in the development of the Academy boys and implemented several policies vital to the operations and development of the Academy. Every year, one scholar will receive this prestigious award for showing great character, excelling in education and working hard in all aspects of their life. These are key areas that Robert focused on whilst working at the Academy. A special shield has been designed to have all the award winners name engraved on them every year. 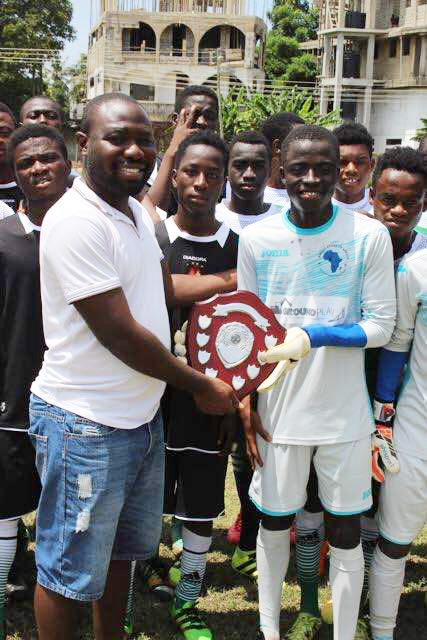 The 2017 award was presented to Gershon Kotey by our UK Trustee Member and Chairman Richard Weal during a match day which the Stars won by 3 goals. The first edition of this award was proudly sponsored by one of our trustees in the UK who also serves as the Chairman of the Board, Richard Weal. Gershon received a cash prize of 500 Cedis towards his educational materials for school and also had his name engraved on the Shield. For more information and sponsorship for this award, kindly contact us at ghana@risingstarsofafrica.com or fill the form on this page.